This attractive 1 bedroom villa is perfect choice for couples, located within walking distance of Agios Sostis, just 5 minutes away. This laid back resort has a handful of traditional tavernas where you can discover a real taste of Greece. There's a small sandy beach, plus it's easy to visit the picture-perfect Cameo Island, from the Port of Agios Sostis. Back at the villa, your own south facing private pool is the perfect spot to relax. Air conditioning/heating in the bedrooms and lounge, pool heating and WiFi are included. It's the perfect couple's retreat. Agios Sostis is within walking distance, with stunning views towards Cameo and Turtle Island. Your private swimming has a prime south facing spot, allowing you to you can make the most of the sun all day long. There's plenty of space to relax as well as a portable BBQ and wooden pergola, where you can dine in the comfort of the shade. Villa Jasmine Sostis sits within a cluster of five villas with a central terrace area providing access to each. There's a communal parking area as well as a gated pedestrian entrance. From the pool area, a few steps lead to a covered terrace and villa entrance. There's also a small table and chairs here - perfect for a simple breakfast. The open plan living area has direct access to the covered terrace and pool area so that much needed cool drink is at arm's reach. With a seating area, dining table and a compact but well-equipped kitchen area, you have everything you need for a comfortable stay. This bungalow-style villa has 1 double bedroom leading to the covered poolside terrace along with a separate shower room, both accessible from the living area. The bedroom is stylishly furnished and has a flat screen TV. This villa is registered and licenced by EOT Greek licensing association. This number is: 0828K10000806901. Villa Jasmine Sostis has a fantastic location, just 5 minutes' walk from the centre of the Agios Sostis. Here, you'll find a handful of traditional tavernas and cocktail bars as well as a small sandy beach. The Bay of Laganas is also within easy reach, where you have the best chance of spotting a Caretta caretta turtle. Our villa, Rosemary Sostis, is located on the same complex. Agios Sostis has a couple of mini markets and a bakery where you can stock up on all your essentials, as well as souvenir shops, and a gelateria for holiday treats. For a wider choice, there's also a larger supermarket 4¼ miles away. Serious shoppers or those looking for something more unusual should head to Zante Town or Laganas, which are within driving distance of the villa. The cafes, bars and restaurants which line the coastal road of Agios Sostis, overlook the beach. The resort is only small but there's still a good choice of local tavernas, offering a true Greek experience, and sometimes with live Greek music! There is a sandy beach in Agios Sostis, with sunbeds dotted along the beach just 5 minutes' walk from the villa. The water here is crystal clear and shallow so it is great for a cooling paddle. You'll also have a fantastic view across to Marathonisi (Turtle) Island. The Bay of Laganas is also just a 5 minute drive away, which is one of the best stretches of sand on the island. Except for pedaloes, you won't find any watersports on the West Coast of the island, to ensure the protected nesting turtles aren't disturbed. Your best chance of seeing one of these beautiful sea creatures is between July and August. Agios Sostis is a great choice for families looking for a quiet and relaxing holiday. You can enjoy a stroll along the beach while turtle spotting, building castles in the soft sands or enjoy an ice cream while watching the world go by. You're within walking distance of the resort centre too, so it's not essential to hire a car. Life at sea is simply wonderful around the island of Zante. Regular boat trips depart from the port in Agios Sostis, including excursions to see the shipwreck at Smugglers Cove and cruises in search of the famous Loggerhead Turtles. Or you can even hire your own private boat to explore the island including a stop off for a swim in the Blue Caves. 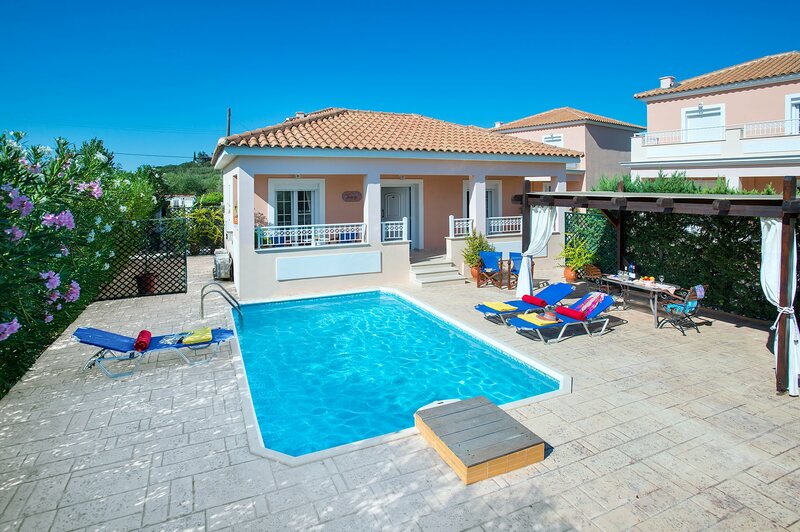 Take a look here at the Zante villas that are currently on sale. Villa Jasmine Sostis is not available to book for season as it is sold out. Take a look here at the Zante villas that are currently on sale. Discover the history of olive oil at the Aristeon Ecological Olive Press Museum, in Lithakia. As you tour through the factory, you will learn about the manufacturing process as well as having the opportunity to sample the delicious olives, oils and products. Watching the sunset at Keri Lighthouse is a must – the views are just stunning. It’s a beautiful spot, so peaceful that you can hear a pin drop and is definitely one for the romantics! Water Village is located in the village of Sarakinado, 4 miles from Zante Town. You can expect a thrill a minute with plenty to do for all the family. Slide head first on a mat-racer side, get lost down the black hole, and try the Free Fall if you dare! Younger children are catered for too with a dedicated Splash Zone and there's a lazy river for a more leisurely ride. Water Village makes a fantastic day out. This impressive Greek Orthodox Church sits in the heart Zante Town, along the waterfront. Home to the relics of Patron Saint of Zante, an annual festival takes place on 24th August, on which the whole island comes together to celebrate his life.